Thanks to everyone who helped this weekend – although the weather wasn't quite as good as last year, we still had some hardened campers arrive on Friday evening to enjoy the bonfire in slightly damp conditions. Good to see the team of Fleggs and Walkers all in attendance although Stuart was missing claiming injury of some sort. Saturday morning Team Kwackers were busy laying out the sections for the Yankee Trial in the afternnon followed by the slalom and BBQ, Bonfire and Booze. No big crashes this year, but Tony F somewhat faster than the competition. The Kwackers team were out again Sunday morning tweaking the sections after a bit more rain overnight. Not a huge turnout for the trial – 32 on Sunday but it seems other events were on the same day. The gate at the top corner with Green Lane will be open at noon. Hopefully the hay will be out this year and it won’t have anyone stuck in the mud. Bring with you your tents, water and tipple plus food especially for the barbecue. There’s a few jobs to be done like loo digging and collecting wood for the evening bonfire. 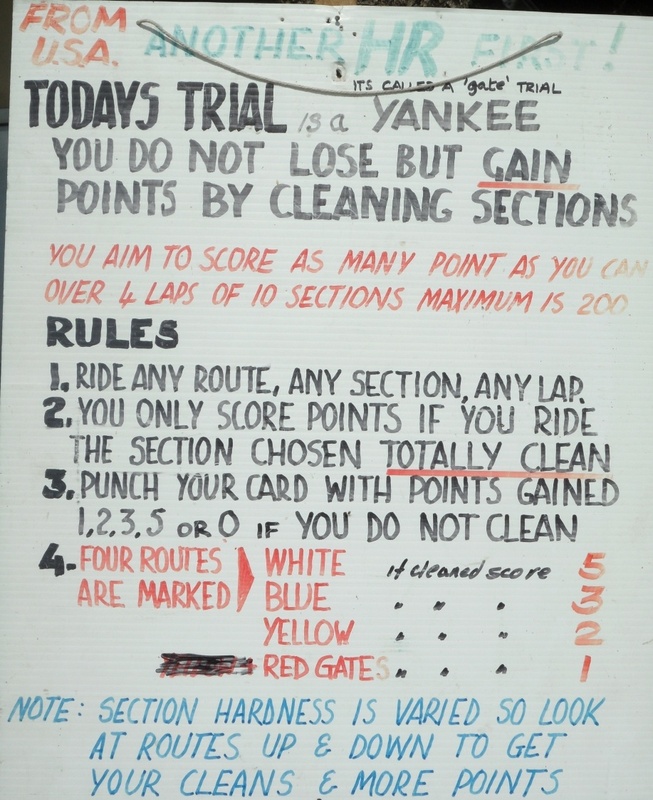 If Team Kwackers have come round from last nights’ shenanigans they’ll be setting out the course for the YANKEE Trial which starts about 1.30 pm. But before then you can hand in your contributory raffle prizes and get your arm twisted to spend excessively on tickets to win them back – it’s a terrible con but all in aid of a good cause!! Then there's the barbecue, slalom championship, possibly wee-skis and of course consuming the beer in front of the fire. A plethora of pics from Steve Hook & Adrian Holloway. with you your tents, water and tipple plus food especially for the barbecue. fire building for the evening sessions where it’s happy-happy! be laid out for you to purchase at your own price!! you finish the last lap. Sections will be at same sites but possibly made harder.